Hi, friends. 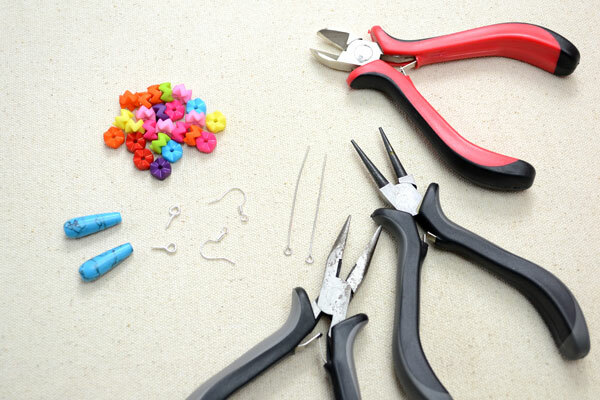 Do you want to make a pair of easy and special earrings? Then you should look here, today I am going to show you a tutorial on how to make a pair of wire wrapped pearl beaded earrings. Follow me to see the making details if you are interested. Thirdly, cut off a piece of copper wire and wrap it around the aluminum wire pattern. Thirdly, make another same earring in the same steps. Look at this special and cool wire wrapped dangle earrings with pearl beads, do you like them? You can try to make one pair for yourself if you like. They are easy to finish than you can imagine. Just take an action. See you next time! Hey, guys. 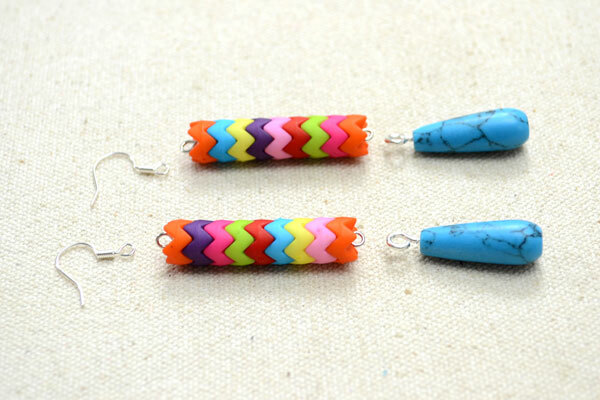 Do you want to try to make a pair of easy dangle earrings? You should see here if you are just a green hand, today I am going to show you an easy pair of resin flower dangle earrings in five minutes and you will be surprised that it is more beautiful than you can imagine. Follow me to see how to make them now. Fourthly, hang a butterfly finding onto the loop of the eyepin. Fifthly, make another same flower earring in the same ways. Now, see them clearly, how is your project going? Do you have a plan to make them by yourself? If yes, hope this project can bring you any inspiration. You also can make them even if you are a beginner, so start your crafting from this project. Hey, girls. Do you want to make a pair of cool earrings for yourself? Then you should look here. Today, I am going to show you a tutorial on how to make simple glass beads chain dangle earrings. Are you interested in them? Now, feel free to follow to check how to make them. Secondly, add seven green glass beads onto the wire. Thirdly, make another same one glass beads chain earring in the same ways. So, how is your project going? Do you think it is simple then you can finish them alone? If yes, just take an action and make one pair for yourself. Other colored glass bead can be added into the earrings making. See you next time! Hello, girls. Do you need a pair of cool wire wrapped earrings? 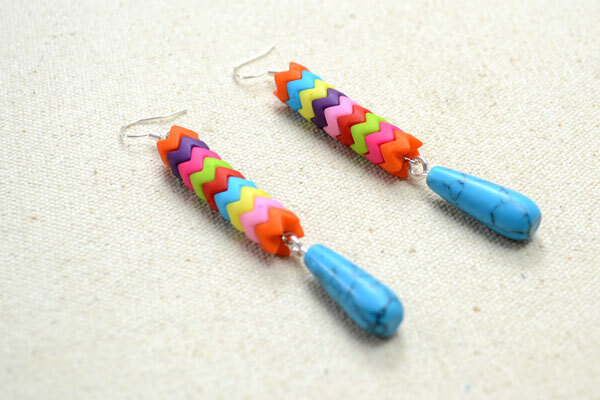 Then you can see here and learn how to make irregular wire wrapped beaded dangle earrings. It is easy to finish and you will know that after you try it. Hoping you will love them. Thirdly, cut off a piece of 0.8mm jewelry wire and make three loops at the end, then add jade bead, seed beads, spacer bead, blue glass bead and bugle bead onto the wire. Thirdly, make another same wire wrapped beaded dangle earring in the same ways. See, finished quickly, right? Now, are you interested in making them by yourself? Different kinds of beads should be prepared firstly, then attach them together by the jewelry wire. Be confident and have a nice try. See you next time! Hey, girls. How are you doing? Are you searching for a pair of tassel chains earrings? Then why do not you make one pair for yourself? Now, I am going to share you a tutorial on how to make glass beads earrings with long tassel chains. Are you interested in the design? Follow me to see more details. Thirdly, attach an earring hook, this dangle and the iron finding together like picture shows. Thirdly, make two 8mm blue glass beads dangles and a 10mm clear glass bead dangle, then attach them onto the pattern. Secondly, cut off six pieces of chains and attach them with an eyepin, then hook them onto the middle bead of the pattern. 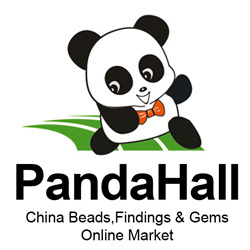 Now, have you got the glass beads earrings making? You can know that we have to prepare the beaded dangles firstly, then attach them in order. The idea of chain tassels makes the earrings beautiful and you should try to apply it to your other jewelry making. Dangling earrings always make people more pleasant. Do you have any simple dangling earrings to keep your good mood? If no, I believe you will love this tutorial. Let us learn how to make dangling earrings together. Firstly, screw the iron pinch bail into the half-drilled turquoise beads. Secondly, thread 9 acrylic beads through a eyepin and loop the other end of this eyepin. Finally, Add the earring hooks, as well as the turquoise bead dangles by opening those two loops that is close to rainbow bead part. Then it is done! Yeah! What a simple diy earrings it is. The project is suitable for the beginners to make a dangling earrings. Chinese Valentine’s Day is around the corner. Chic outfit and stunning jewelry are necessities for this special occasion. Then this pair of charming chain earrings tutorial you can never miss. First, thread a clear glass bead unto an eyepin. Make a loop the other end of the pin. Repeat to make other one. Second, cut a piece of brass chain to about 41 links. Attach the loop to the center of the chain and repeat to make the other. Third, thread two head pins onto a heart bead. String the ends of the pins respectively on the ends of the chain. Twist the rest pin part to make a small circle as what the following picture shows. Fourth, open the loop of the earring hooks and attach it to the earring dangles. Here is the final look of those charming chain earrings. Are they fabulous? Have you got the technique of DIY such chic chain earrings? The materials are quite cheap and affordable and are totally within your budget. Have a nice try, the result will be terrific!